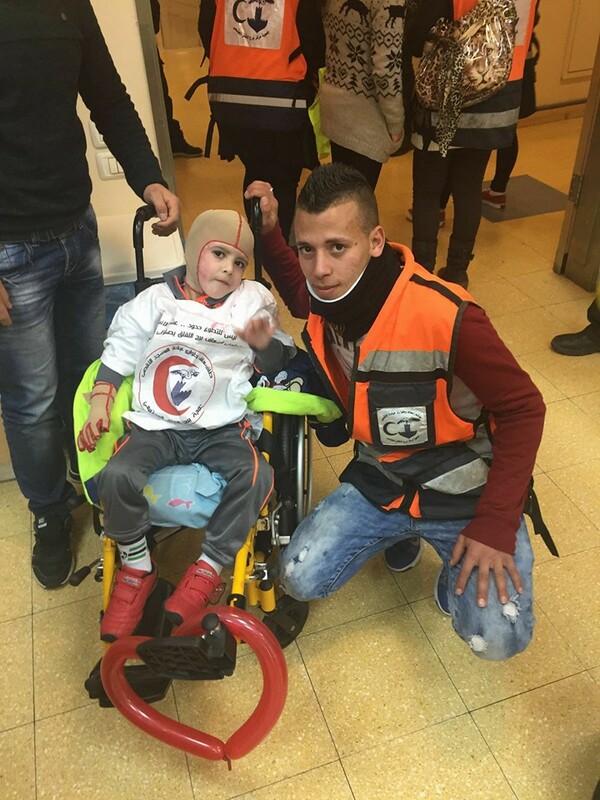 The first-aid staff of Al-Aqsa Mosque clinic, in partnership with Burj Al-Luqluq Social Center Society, organized an open day for patient children in Hashomir Hill hospital in Tel Aviv. The activity focused on the Palestinian children in the Hospital’s departments. The staff visited the injured boy, Ahmad Al-Dawabsha, and gave him gifts which made him feel happy and comfortable. Other patients were given presents, sweets, balloons, in addition, they made drawings on their faces and gave flowers to their companions. Moreover, two clowns Ahmad Al-Ju’beh and Mohammad Zein volunteered to present clowning shows to entertain the children. Wisam Hammoudeh, the First-Aid unit administrator and coordinator, confirmed that this activity happened within the staff effective activities to extend our work, activate our social and humanitarian role in different life aspects, reaching the occupied Palestinian territories since 1948 and communicate all categories and Psychological support to injured children specially Gaza’s children . In conclusion, Ahmad Al-Dawabsha was the only survivor from the Settlers’ fire in Nablus, all of his family members were dead, and so these types of visits are essential for psychological support and giving hope to injuried.